The annual Railforum (Jernbaneforum) was held on March 8 th in Oslo and as always it gathers most stakeholders playing a role in the Norwegian and Scandinavian market for rail transportation. The Norwegian minister of transportation Ketil Solvik-Olsen opened the conference this year as in the last years and pointed out the importance of the new National Transportation Plan (NTP) 2018 – 2029 and the significant increase in resources for infrastructure improvements in Norway the next years, including the development of a national freight strategy. An important part of the program was the presentation by the Chinese ambassador to Norway of the New Silk Road project. One of the main questions hanging in the room after this presentation was how will the Nordic countries use this historic opportunity in the development of their own infrastructure and their Asia trade strategies? Representatives from the Norwegian fish exporting industry followed up in the presentation thereafter and pointed out that fish export in few years will be more important than oil and gas. They are constantly looking for more environmental smarter ways to export the fish to the markets. At the moment the lack of consistent infrastructure between Norway and Sweden and the European continent was a challenge. It ment that the exporters to day have to reorganize the transport of salmon, from trains – mostly going through Sweden – and onto trucks from the Oslo and then send them by road south to the continent. This is not a very efficient way of doing this, and it creates a lot of unnecessary road traffic around Oslo. After these two presentations there was a joint presentation by COINCO e.V. by Knut Halvorsen (also DB E&C) and Thomas Kokel from DB E&C who presented the Baltic Sea Tube Bridge (see article from June 2017) as a solution to the challenge of both connecting the Scandinavian freight infrastructure to the New Silk Road (with a driverless freight train solution) and also provide a more sustainable mode of transportation of salmon in the future. The ideas was received well. Many contacts were made and will be followed up. Our association has for a long time been working on making the Norwegian and Swedish government cooperating better, by start planning – and eventually build – a modern rail connection between Oslo and Gothenburg. The idea of High Speed Rail (HSR) has been left since Norway decided to not go for faster trains than 250 km pr hour. Recently also Sweden did the same (in their suggested NTP that was presented end of August). But still a modern railraod is needed especially for the growing trade flows between the two countries. Today more than 2500 trucks passes the boarder and these cause a lot of unessary emissions, trafic jams and accidents. To build a modern mixed trafic rail road has been high on the agenada for COINCO since the very start and that is why we have introduced the project COINCO North in our terminology. “The majority of committee are recommending that a concept study for boarder crossing freight trafic is done as a cooperation between Norwegian and Swedish governments”. On June 14th COINCO e.V. arranged together with Technische Hochschule Wildau a seminar on new ways to connect Scandinavia via Sweden to North East Germany on the premises of IHK in Fasanen Strasse in Berlin. Christian Wiesenhuetter hosted the seminar and Knut Halvorsen was moderator. The seminar was open for members of COINCO e.V. and specially invited guest from the logistics community. Six engineer student teams from the department of Intermodale Verkehre und Infrastructur at TH Wildau, under the leadership of Professor Jens Wollenweber and Dipl.-Ing. Philip Michalk - went through two main concepts. Specially invited experienced engineers from DB E&C and DB Cargo where invited to give their comments. Some of them had also participated in a workshop at TH Wildau on the 15th of May. Three of the student groups presented first the “tube bridge for driverless freight train” concept. Based on the tube bridge technology – at first developed in relation to the aim of the Norwegian Road Administration of crossing the western Norwegian fjords for double lane road traffic concepts – a specialized concept for pendel traffic through a single track in one tube of 100 km for freight trains between the Swedish town of Trelleborg and Sassnitz, had been part of the students work through their spring semester. The students had looked into the basic economics of the concept, how to optimize the logistics flows, where to locate the different types of infrastructure involved, energy use etc. The tube bridge technology is based on the principle of sinking down a tube of concrete and then balancing gravity forces and the uplift forces in water. The tube has the same characteristics as a tunnel, but cost much less than half to produce since it can be constructed by pre mass produced elements. The Baltice Sea in this part is considered perfect for tube bridges, it is flat and only between 40 -60 m deep. The estimated costs of the tube bridge solution in question is 5.5 – 6 bill euro which is significantly less than previous concepts (tunnel). The students had done good work and advanced the ideas tube bridge for freight trains significantly. The other three student teams had looked into a hyperloop connection between Malmø and Berlin, with a stop in Stralsund. Hyperloop is still in an early stage and the first basic testing are this year taking place in the USA. It is based on the principle of transportation of people and goods in units (pods) by maglev, in tubes with reduced air pressure and as near vacuum as possible. This combination can in theory create speed of up to1200 km pr hour. The journey from Malmø to Berlin would thus take less than 20 minutes. Hyperloop can thus replace air planes in the intermediate distances both because it is faster, safer. It uses less energy pr transported passenger and is thus also less costly than flights. The students had looked into the market potential, how the traffic pattern could be organized and different technical aspects. It is expected that if one can build a hyperloop connection between Malmø and Berlin and as suggested here, it would replace much of the air traffic between a large part of Southern Scandinavia (including Stockholm and Oslo). The student teams had approached the topic with great enthusiasm and skills and especially it was fascinating through a video animation to get an idea on how the first hyperloop station in Berlin could look like. The beginning of COINCO North goes long back. 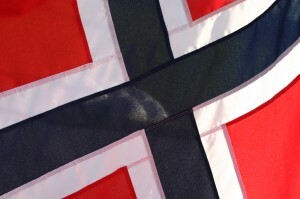 One could say that it has its background in the year 1905 and the dissolving of the union between Norway and Sweden. This was the year and the reason the rail project between Oslo and Gothenburg was stopped just outside the border town Strømstad 20 km south of the Norwegian border. A serious attempt was done in 1989 to get the rail planning start again, but the Swedish and Norwegian authorities managed that time only to agree on new road (E6) between the two cities. The new four lane road bridge of Svinesund was opened in 2005. That was also the same year that the first interreg project COINCO was started. COINCO North was the second project – starting in 2008. Since then there has been an increased activity (see previous articles) to make the politicians of Norway and Sweden to agree on starting serious planning for making modern railroad between the two cities. The last ten years the truck traffic over Svinesund (the narrow fjord between Norway and Sweden) has increased between 6 – 8 % pr. year. There are now more trucks passing Svinesund than the Øresund bridge, creating huge traffic congestions and environmental challenges for both Norway and Sweden. In 2016 COINCO e.V has been actively involved in bringing together administrative, political, industrial and financing partners in Norway and Sweden for the development of the COINCO North corridor. The reason was the expectations on the report by Jernbaneverket and Trafikverket (Norwegian and Swedish rail planning authorities) that was finally published in May 2016 (half a year delayed). However the report was too narrow in its perspectives and did not get into the real economic analysis. It suggested that the main future rail corridor – for both passengers and freight – should go through the Norwegian border town Halden and through Dalsland (to the east and inland in Vestra Götaland in Sweden). This was not acceptable for the City of Halden. The preliminary plans showed that the infrastructure would destroy most of the central urban areas of Halden. First of all it was the need to lift up the whole rail infrastructure 2.7 meters due to the expected rise in sea level (because of expected global warming). This would mean a large “wall” or barrier through the city. Another issue was the steep hills south of Halden (Tistedalsbakkene), which means that one needs to divide the freight trains in two and use extra locomotives to get up the hills, with all the logistic fuzz and noise that would create. The politicians in Halden said no to this. The whole process was in danger of ending up in a dead lock. Also central government in Norway (Jernbaneverket) agreed that this was not a good solution. A new round of planning, where one is looking into more alternatives was therefore needed. The secretariat of COINCO e.V. started all ready in spring to work with the City of Halden to look into other alternatives and to lobby again make the Norwegian and Swedish governments willing to make a new and complete concept study with more alternatives, included economic cost benefit analysis. One of the alternatives would be to look into finishing the 1905 plan. This would also mean the upgrading of the Bohusbanan (on the West Coast of Vestra Götaland). An intensified lobby during the year, with meetings in Oslo, Halden, Strömstad (the border town and end station on Bohusbanan on the Swedish side) and Gothenburg took place during the year. In addition a series of articles in influential Norwegian and Swedish newspapers were published. The aim has been (and still is) to get a decision of a full concept study in the Norwegian National Transportation Plan (NTP) by the Norwegian Parliament in the summer of 2017. In parallel one has been working on lobbying the Swedish government to make a similar decision on the Swedish NTP in the summer of 2018. The Norwegian government has in several official documents already stated that a new and more thorough planning will be initiated. As late as December 13 th (after the annual report for COINCO was written) the Swedish transportation committee (Trafikutskottet) made a decision to “advice the Swedish government to develop a border crossing strategy for rail”. What the final decisions will be, one will when the NTP in Norway is decided in the summer of 2017 and finally when the Swedish one is decided 2018. The lobby work will therefore continue in 2017. The COINCO South was not much in focus the first half of the year, since COINCO North needed most attention. But it was also a fact that the preliminary cost estimations done, related to building a 100 km tunnel with conventional methods between South Sweden and North East Germany, seemed to make the project difficult to finance. The cost estimates were ranging between 10 bill. euro and up to even 25 bill. euro. In the latter case it would clearly not be a profitable project (widely defined). With an estimated price tag of 10 bill. euro it was in the possible range of being profitable. However these were in any case unsecure estimates. However during the summer of 2016 there were some significant developments in what some likes to call “The fifth form of transportation” – hyperloop. The story of hyperloop transportation goes in fact all the way back to 1799. The first pneumatic transportation system was set up (but did not survive very long) in New York in the 1860-ies. It was in fact outcompeted by steam locomotive trains. Elon Musk brought new life into the idea around 2012 and since then the hyperloop technologies have been in rapid development. Since May 2016 the drivers of the industry have decided to leave the “air shuffle board technologies” principle and go for maglev (magnetic elevation) principles. This has been a break through since maglev is a much more proven technology and is actually in use many places (airport express train in Shanghai). Also the first successful test rides were done last summer in USA. The hyperloop technology became relevant also for COINCO e.V when a study was published in July on a suggested hyperloop connection between Stockholm and Helsinki (in 30 minutes). Most of the stretch was suggested to be as tunnels under the Baltic Sea, and this alternative would therefore also be very costly and in fact not profitable. The idea developed and spurred by the crises in the Norwegian petroleum offshore industry, (due to the low oil prices), it became evident that there is a lot of available capacity on how to build tube infrastructure on the sea bottom. The idea came up: Why not just lay the hyperloop tubes on the sea bottom instead of drilling expensive tunnels? A first investigation of the cost advantages shows that this method could be as low as only one tenth of the conventional cost. All of the sudden it has become clear that a fixed link between South Sweden and North East Germany could cost much less than the cost to build the Øresund bridge, and it could have a much larger market. The main advantage of the hyperloop is the claimed reduced construction costs, the environmental benefits and the high speed. The critique is listi.ng the problems of temperature fluctuations and safety. At the sea bottom the air temperature are relative constant and if one starts with transporting freight, peoples safety is not a big issue. The sea bottom is also in general much more safe for possible terrorism than on land. COINCO e.V. has already gathered a lot of information on the actual corridor here defined as COINCO South. It turns out that this particular corridor is one of the best suited corridor for an underwater hyperloop link in Europe, possible also the world. A concept study of a hyperloop connection between Trelleborg/Malmö and Sassnitz/Stralsund/Berlin was thus initiated in November. The first results were presented in Malmø on the 14 th of December and on the annual assembly for COINCO e.V. the day after, in Berlin. The feedback from experts, politicians and planners has been positive, and a further investigation with the Norwegian architect company Snøhetta and potential industrial partners in both Scandinavia and Germany and rest of the world is now starting up. One will hear much more of hyperloop in year 2017 (Hyperloop KH Shorten English Version 15 th of December 2016). After many years of lobbying, and through three Interreg project periods, each of three years of COINCO, COINCO North I and II (2005 – 2013), it was in Desember 2013 finally possible to make the Norwegian and Swedish goverments to agree on looking into the upgrading and investments of a new main rail transportation corridor between Norway and Sweden and thus further to the Eurasian continent. Since January 2014 there has been a Swedish – Norwegian committee with representatives from both Jernbaneverket and Trafikverket assessing the needs for upgrading of the so called Missing Link in the corridor between Oslo and Gothenburg (see article below). The work has been delayed. On the Norwegian side the attention of the authorities have been into getting the planning of the 16 bill Euro Inter City project around the Oslofjord up and going. In the same period there has been a change in the Swedish government with slightly other priorities. Trafikverket has started up its large HSR project that is expected to cost 33 bill Euros. The planning and design has started and one day this new system will connect Stockholm with Gothenburg and Malmø with trains with speeds up to 320 km per hour. It will reduce the travel time significantly and increase capacity for freight trains also. These two major Norwegian and Swedish projects have taken a lot of attention and resources, and we are sorry to say that they have also led to the fact that the Norwegian–Swedish border crossing project between Oslo and Gothenburg has had less attention and priority than two years ago. In March this year (2016) the committee is publishing its report and it seems to be only marginal improvements suggested. Some of the report has been leaked and it is signalled that only marginal improvements, and small sums will be invested up to 2050. COINCO e.V. has thus last fall gotten together with some of the same stakeholders that were part of the COINCO North I and II projects and also new actors from the private sector. Among the new stakeholders are Norway’s biggest bank, Den Norske Bank, industrial companies like Norske Skog and Borregård, KPMG, Deutsche Bahn International and associations like the Swedish–Norwegian business association, MarLife (fish exporter association), Spacegroup and COINCO e.V. The group has done economic investigations and looked into more radical improvement. The concept is double track line for mixed traffic (passenger trains for 250 km pr hour and freight for 110 km pr hour) all the way between Oslo and Gothenburg. The calculations show that if one improves the infrastructure with double tracks this will reduce the travel time between Oslo and Gothenburg to two hours (instead of four hours today). If one introduces economic incentives that make it slightly more economically interesting to transport by train rather than by truck, then up to 50% of today’s transportation by trucks will be shifted to trains. The most likely alternative implies investments of about 2,5 bill Euro. It consists of a combination of 25 km new tracks in the border area (including a 500 m bridge), and then an upgrading of the existing single track line (Bohusbanan). It then goes down the Western Coast of Sweden from Strømstad and south to Uddevalla. The project is so profitable that it would be possible to get international financing through a Public Private Partnership (PPP) model – if the Norwegian and Swedish governments are open to this. However given the political situation in Norway and Sweden, a Public-Public model – like the one that Sweden has with Denmark in the Øresundbridge consortium – is most likely. COINCO e.V. will be active in the partnership that has been created. It is now growing with more political support, industrial partners, transportation companies, labor associations, environmental associations etc. The COINCO North issues will be the main focus in 2016 and 2017 since these are also the years with opportnunities to get the “Missing Link” project into the National Transportation Plans in Norway and Sweden. More information about the initiative can be found here (only in Swedish and Norwegian). On November 25, 2015 · In COINCO e.V. The founding of the association COINCO e.V. took place in Berlin on July 3rd 2014, however the formal registration was not in place in Amtsgericht Charlottenburg before March 12th 2015. 2015 was thus the first operational bussines year. On November 25 th 2015 the first annual assembly was held in the venue of IHKs headquarter in Berlin. Most of the activity in first half of 2015 was aimed towards getting financing for the COINCO South activities, however there were not enough interest at this point for the research program COINCO Challenge II. Second half of the 2015 was mostly dedicated to the COINCO North issues and getting together stakeholders who are interested in putting pressure on the Norwegian and Swedish government to more ambitious for the upgrading of the Missing Link between Oslo and Gothenburg (see article above). The annual report for 2015 is available here. (Annual report for 2015). From COINCO GmbH to COINCO e.V. On July 3 th 2014 the association COINCO e.V. was founded. The founding meeting took place in IHK Berlin. Knut Olav Halvorsen was elected chairman and Christian Wiesenhütter vice chairman of the board. At the same time the COINCO GmbH has been closed down. All the activities, material and immaterial rights etc have been transferred from the GmbH to the association. Representatives from both Swedish, German, French and Norwegian stakeholders – from both industry and academia – have joined. The background for the change of organization from COINCO GmbH to COINCO e.V. was the need for a broader base for the next steps, where an association is a more suitable platform. The aim of the association is to stimulate research in to different question related to the development of large infrastructure projects between Germany and Scandinavia. Up until now the COINCO Challenge has been mostly student work. The results have been so interesting that academic institutions like TU Berlin, TH Wildau, HTW Berlin and FH Stralsund now want to mobilize their experienced researchers to look into different questions. Other academic institutions and industry representatives will also be invited in. The first step for the COINCO e.V. is to raise funding for the research program COINCO South tunnel viability study, conducted by TU Berlin. Norway and Sweden: Talks are on. In September the Red/Green alliance (Ap/SV/Sp), lead by Mr Jens Stoltenberg lost the elections after eight years in power. A new Blue/Blue alliance (H/FrP) lead by Ms Erna Solberg took over in October. 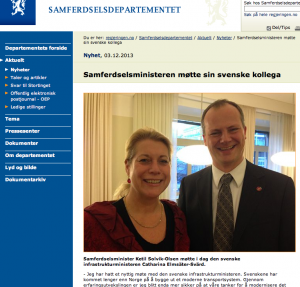 The new Minister of Transportation Mr Ketil Solvik-Olsen (FrP) did not waste much time. On 2 th of December he met his Swedish colleague Chatarina Elmsäter Svärd in Stockholm to discuss closer cooperation of the planning and building of train infrastructure between the two countries. The ministers agreed to set down a group of high level civil servants in the ministries to especially look into the Oslo – Gøteborg corridor (COINCO North) and some other possible Norwegian – Swedish transnational rail crossings. The border passing and the 100 km one-track and old and beat down rail track between Halden and Øksnered (on the Oslo – Gøteborg corridor) is considered the most important one for the future trade and growth between the two countries, especially for Norway. There is now a considerable interest among the Norwegian and Swedish central authorities to upgrade this important part, often called “The Missing Link” of the COINCO North, to a modern double track infrastructure with HSR standards. This northern missing link, is considered necessary for stimulating transport from trucks to rails, and is thus also a conditions and an important ”peace in the big puzzle” that builds up to the logic of the tunnel solution in the Southern part of the COINCO, that is between Sweden and Germany. Connecting Sweden to Germany through more than a 100 km long tunnel under the Baltic Sea is an extreme infrastructure project. It raises fundamental questions – both technical, economical and political – that no one has looked into in depth before. It could turn out yet that such a tunnel can change the transportation patterns and the regional economics of North East Germany and Scandinavia. It has the potential to create thousands of jobs, radically reduce emissions and the overloading of trucks on the highways in Germany and Scandinavia.These kind of questions are intriguing for curious professors, researchers and students of engineering, tunnel building, rail planning, urban and regional economics, environmental impact studies and more. Through the program of COINCO Challenge we are inviting universities and technical colleagues to look into different questions and topics around the COINCO idea.The participants are free to investigate into topics where they have their professional interests – wether it is a bachelors project, masters study or PhD. The secretariat of the recently founded COINCO association will make sure that there is coordination of the topics between the participants, although some overlapping and different angles to the same topic is regarded only as positive. Use of the COINCO web, seminar and workshops will be arranged to bring the different studies and results together in the multidisciplinary approach of the COINCO Challenge. The first project results from the COINCO Challenge was published by FH Stralsund on May 30th 2013. Other participants on the way are: BTU Cottbus, TU Berlin, TH Wildau, HTW Berlin, tbc … For more information, please contact Carmen Reiz, our project coordinator. In September the Red/Green alliance (Ap/SV/Sp), lead by Mr Jens Stoltenberg lost the elections after eight years in power. A new Blue/Blue alliance (H/FrP) lead by Ms Erna Solberg will take over on October 18th. One of the last initiatives from Mr Jens Stoltenberg’s government was to present the new National Transportation Plan (NTP) and pass it through Parliament on June 18th. In the NTP – covering the period of 2014 – 2023, an investment plan of 65 billion Euro for a new InterCity system around the Oslo Fjord was decided. The IC system will be build with HSR standard. The investments in the South Eastern part of the system will be a continuation of the already decided Follotunnel – Ski (Follobanen) starting up next year and built further south into the county of Østfold, and reach the border city of Halden by 2030.